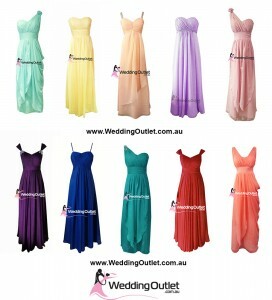 At the WeddingOutlet.co.nz we sell bridesmaid dresses in over 30+ styles and 55+ different colours. We also allow our bridesmaids to mix and match styles with different colours, that way your favourite colour can be made in the style you most love. Some bridesmaids will even get a range of shades or colours with the same style, this can be hard to find in retail stores but we can offer this to our customers. If you haven’t already noticed, organising your bridesmaid dresses for your bridal party is harder than once thought. You need to order the right size, get everyone to agree on the colour, choosing a style that suits every bridesmaids’ figure. It is very hard to cater to everybody needs. What I would say is choose the style and colour that YOU love most. I mean, everybody has their opinions but at the end of the day it is your wedding and the bridesmaids should understand. If you are worried about some styles not being flattering to some bridesmaids. What you can do is let the bridesmaid pick their own dress and then you just pick the colour. That way you know the bridesmaid will feel comfortable wearing the style they chose. And also, it looks quite unique having the bridesmaids in different styles. Below is just a just a few of the styles we sell, please click on the link below for all the styles and colours we stock.